Book to film adaptions are essentially an act of translation. As with languages, each medium has its own limitations and advantages. But is a successful adaption just about accurately representing the original story? As translators must navigate cultural disparities and idioms, adaptors must transform the mental experience into a visual and audio one. To answer that question, we must first consider why we enjoy adaptions – I believe it is so we can re-live the story. Book lovers will be very familiar with the impossible wish to re-read a book as if it were the first time. Some people believe that this means a successful adaption must follow the original and frown upon any disparities. However, it is the differences, the unexpected surprises, that allow us to re-experience the magic of the story. Howl’s Moving Castle is a great example of this. Originally written by Welsh author Diana Wynne Jones in 1986 this book was adapted into an animated film by Japanese film-maker Hayao Miyazaki in 2004. In both versions Sophie, the main character, is cursed into the body of an old crone and thrust into a journey of self-discovery, friendship, and love. The story begins with Sophie working unobtrusively, tucked away in the corner of her family’s hat shop. That all changes when she meets Howl – a wizard rumoured to eat the hearts of beautiful young women. But the real danger comes after, when The Witch of the Waste, jealous of Sophie, curses her with a ninety-year-old body. Sophie decides she can’t stay at home and takes off. After a number of incidents, she ultimately arrives at Howl’s Castle. Here, Sophie makes a deal with the fire demon Calcifer, both promising to break each other’s curses. 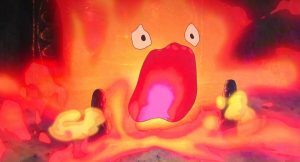 As Calcifer’s curse is shared with Howl, Sophie poses as a cleaning lady in order to infiltrate Howl’s castle. 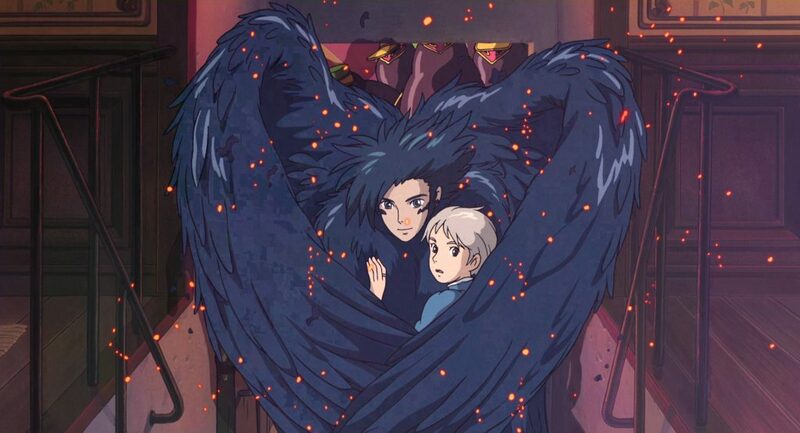 Luckily for her, Howl does not eat hearts, he merely steals them with his good looks and charm. It is in the visual representation of the characters’ internal battles that Miyazaki adds his own symbolism. Sophie’s insecurities and bouts of confidence are illustrated by her occasional transition from crone to a young woman, in the moments when her excitement overcomes the curse. This curse is not only represented by her elderly appearance but, also, by her silver hair, which remains even once the curse is broken, to visually mark the ways in which her character has grown. Howl’s curse is represented visually with an ability to transform into a bird-like creature when he indiscriminately fights war planes to protest the on-going war. As the film progresses, this form becomes more and more monstrous. As a review by The Readventurer comments, ‘it was a really interesting way to show him losing the fight against his curse’. It is in these small changes that Miyazaki skilfully navigates the treacherous waters of adaption. Of course, it is not just these translations from mental to visual which makes the film a successful adaption. It is also the differences. These surprises bring back the exciting element of the unknown and gives viewers a chance to see the story re-imagined. As for the film adaption of Howl’s Moving Castle, there are certainly some significant surprises. It is after Sophie moves into the castle that the stories branch off dramatically. In the book, we learn that Howl is originally from Wales and uses a magic door to travel back and visit his family. The antagonist is, most decidedly, The Witch of the Waste, and Sophie has the magical ability to ‘talk life into things’. 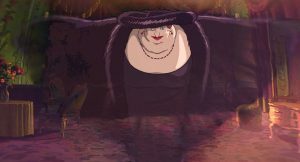 However, in the film Miyazaki leaves Sophie un-magical and, through a series of events, casts The Witch of the Waste in a more sympathetic light. He also creates a new antagonist, Madam Suliman, by combining two characters from the book. This is to make room for the entire war he adds into the story. In the book, there is a potential war brewing but Miyazaki brings this to the forefront of the film with bombs, gunships and a draft of wizards. 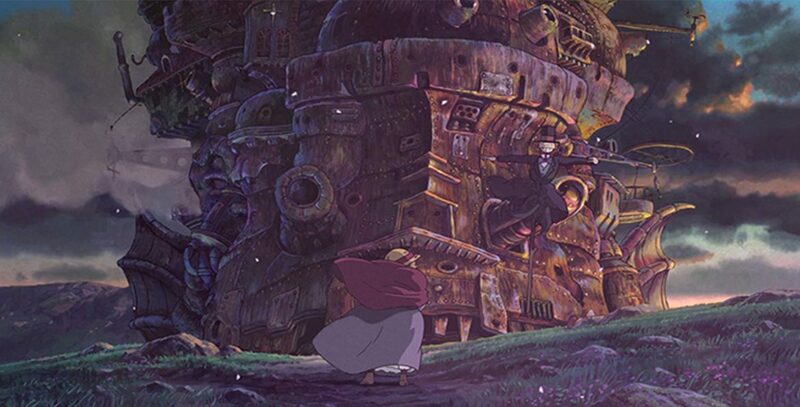 The film carries a strong anti-war message which is a common theme in many of Miyazaki’s films. Every story holds little pieces of their creators and the best adaptions also incorporate parts of the adaptor. 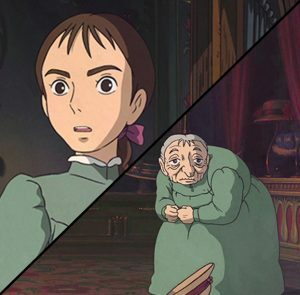 When examining Howl’s Moving Castle, it is easy to see the lives of Diana Wynne Jones and Hayao Miyazaki reflected in their work. For Diana, it was her childhood spent in Wales, the Lake District, famous for its witches, and a number of other places that expressed itself in Howl’s Moving Castle. In the book Howl takes Sophie to Wales to visit his sister’s family. Diana paints a charming if a bit drizzly Wales, sharply contrasting our reality with Sophie’s enchanted realm. Many of Diana’s works, such as the Chrestomanci series, are heavily woven with threads of fantasy and magic. She lived, for a while, in Thaxted, Essex, about which in her autobiographical essay she, reportedly, wrote, ‘improbable characters abounded there, including two acknowledged witches and a man who went mad in the church porch at full moon’. It is hard to tell if the people and the stories populating the Lake District and Thaxted inspired Diana or if they merely resonated with an innate curiosity in the fantastical, but this interest is beautifully explored in Howl’s Moving Castle. As for Miyazaki, two of his common themes, anti-war and aviation, have been incorporated here. Born in 1941, just as Japan entered World War Two, Miyazaki grew up particularly aware of the consequences of war. As a result, he has developed a strong anti-war stance evident in many of his films – Princess Mononoke, Nausicaa of the Valley of the Wind, and The Wind Rises, to name a few. He also actively protested the change to article 9 of the Japanese constitution, saying that he did not believe Japan should have a national army. 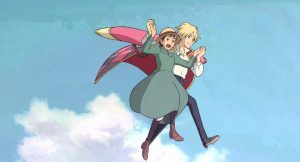 The inclusion of war in Howl’s Moving Castle allows the film to have a faster, more dramatic pace which works well with this story-telling medium. It also gives the audience a chance to explore a new side of the characters. Howl is just a bit more heroic, The Witch of the Waste is a broken-hearted woman, and Sophie is empowered much more by love than magical ability. 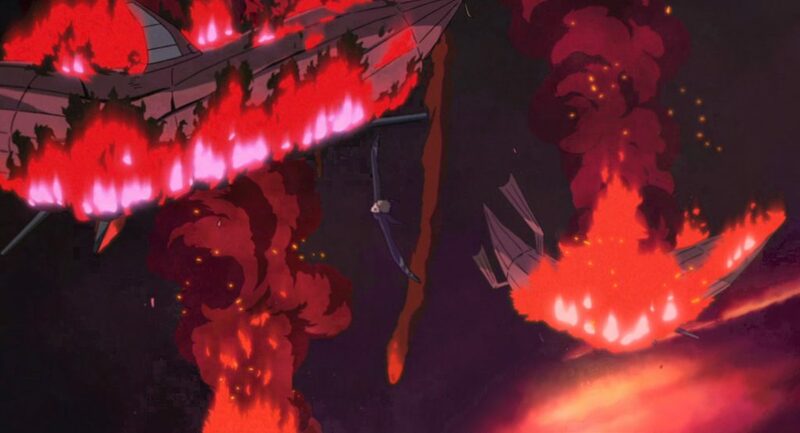 As for aviation, Miyazaki also added-in several flying scenes. His fascination with aviation can be traced back to his father who worked at Miyazaki Airplane which made parts for fighter planes in World War Two. Miyazaki delightfully re-tells Sophie and Howl’s first meeting by having them magically fly across roof tops as they run from The Witch of the Waste’s henchmen. There are also plenty of awe-inspiring scenes full of war planes and Howl in his bird-like form. It is the variations in Miyazaki’s film that breathe new life into this beautiful story, allow you to revel in the similarities and excitedly discover the differences. This is what makes a successful adaption; one which lets you appreciate the original even as you fall in love with another version. This adaption is a perfect example of the artistic fingerprints that get left behind, if you only know where to look.